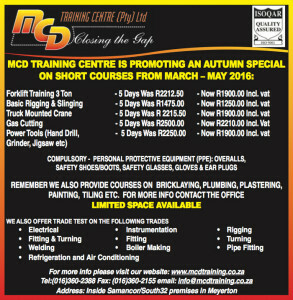 Instrumentation facility at MCD Training Centre is now in operation for all your training needs! We are proud to announce that our new Instrumentation work shop and training facility is fully functional and is ready to take on new apprentices/learners at our Meyerton Branch. BHP Billiton has invested over R3.5 million in this instrumentation training facility with the latest high tech equipment. Our new instrumentation facilitator is in charge of the department and is highly qualified to give the quality of service in training that our customers deserve.